This cat a nice cushy napping spot next to an Access Virus TI Polar or WhiteOut Edition. Submitted by Vahakn Ma‎ via our Facebook page. 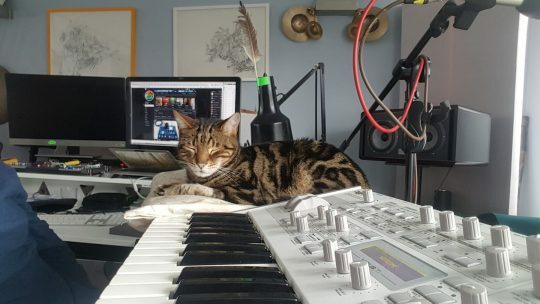 Well, every “regular synthcat” that appears on CatSynth is special 😺. 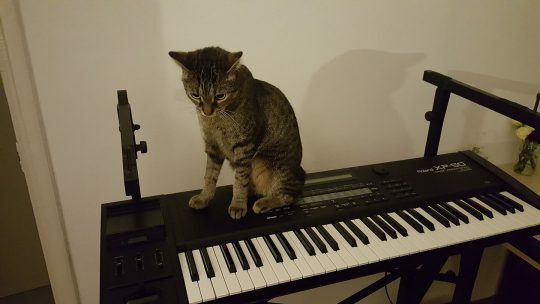 But this cat also has an interesting synth. This appears to be a Virus TI Polar Edition – white-on-white. You can hear Ma’s music as Harky DJ here. Beautiful Lilli sits atop a Teisco 110f synthesizer. Submitted by Edda Hill via our Facebook page. I confess I am not that familiar with Teisco synthesizer line, let alone the 110f. Here is a bit from Vintage Synth Explorer. In the beginning of the 80’s Kawai began manufacturing synthesizers under the company name of Teisco. Their early designs resulted in synths like the S110F above. The Synthesizer 110F is an upgraded S60-F, with dual analog VCO’s and an updated look. It has a small but usable 37 note keyboard. Classic analog sawtooth, square, and triangle waveforms plus noise are on-board and can be mixed with external sounds run through the 110F’s filters and envelopes. The oscillators can be de-tuned for duophonic textures or phatter leads and bass sounds. From Melker Häggbom Klingberg via Facebook. My buddy Dexter, figuring out how to set the MIDI channel on the driftbox. The REON Driftbox series of small synthesizers was introduced last year. Dexter’s appears to be a Driftbox SE model. The REON Driftbox SE is a digital paraphonic Synthesizer with 2 digital oscillators and an analog Steiner Parker filter. It features also an impressive amount of connections on the backside. 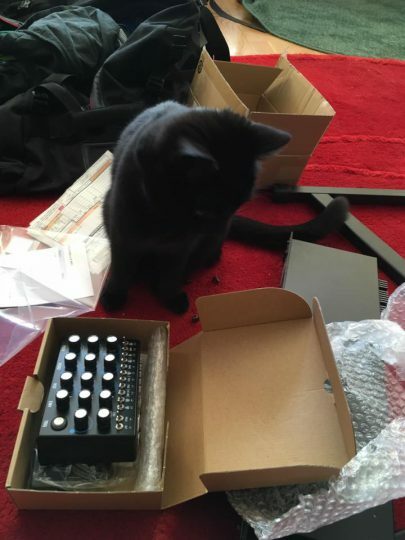 We at CatSynth are learning more about these interesting little boxes. I find myself particularly intrigued by the J and S models. 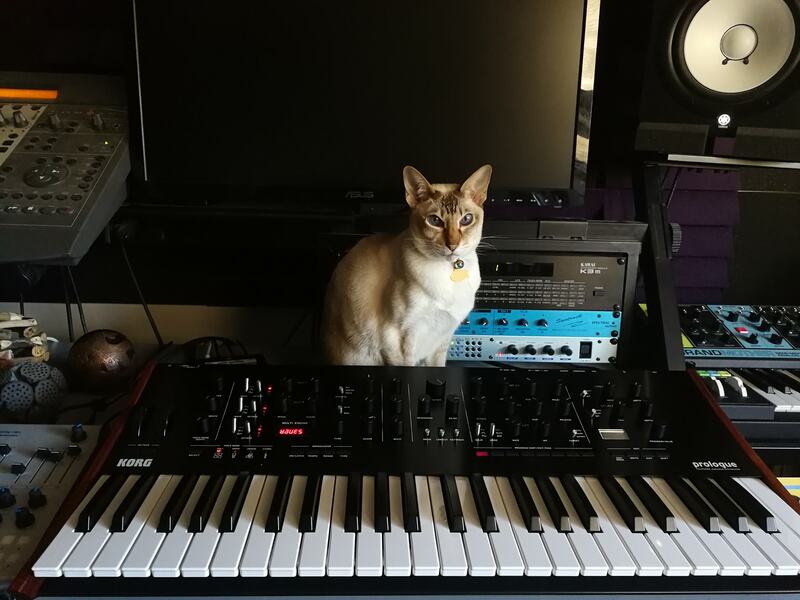 Cat posing with a Korg Prologue synthesizer. From James Maier on Facebook. The Prologue is a mixed analog and digital synth, with an intriguing open architecture for the digital oscillators. You can read on brief NAMM review of the instrument here. 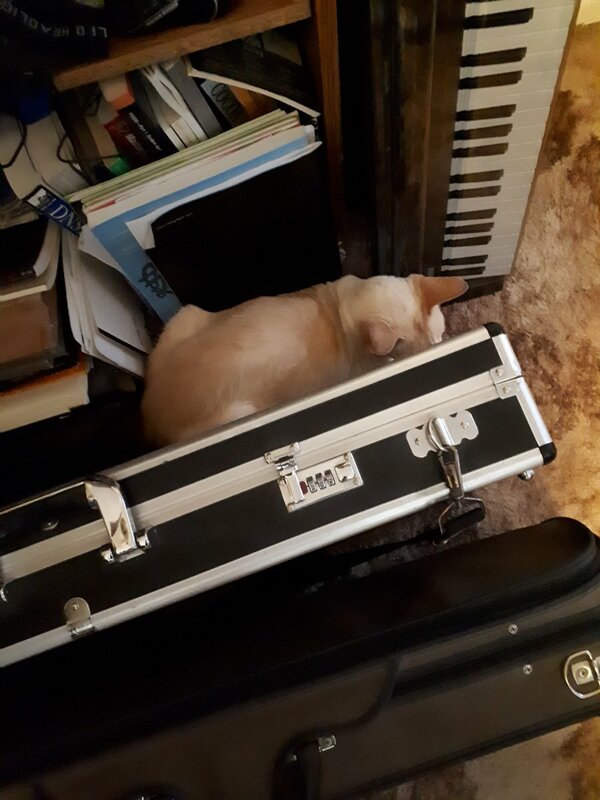 This cat has found a cozy resting place between a Yamaha Reface DX and various violin cases. From our friend Chrissie Caulfield on Twitter. 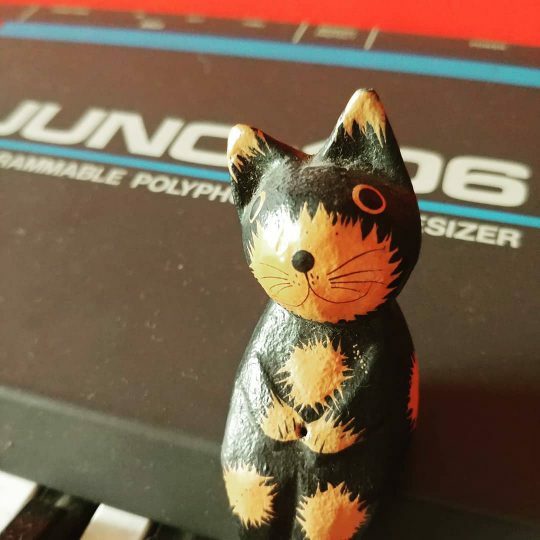 Our wooden feline friend is back, this time on a vintage Roland Juno 106 synthesizer. Submitted by thedigitalpurrgatory (Anton Largoza-Maza) via Instagram. You can see a previous appearance here. This is the second appearance of the Juno series in less than a week. Last Thursday we featured the Juno 60. The Juno 106 has a full MIDI implementation, including SysEx based editing and control, as opposed to the 60 which has no MIDI at all. Sound-wise they are quite similar, although many say that the 60 has a “warmer sound.” We at CatSynth cannot verify this. 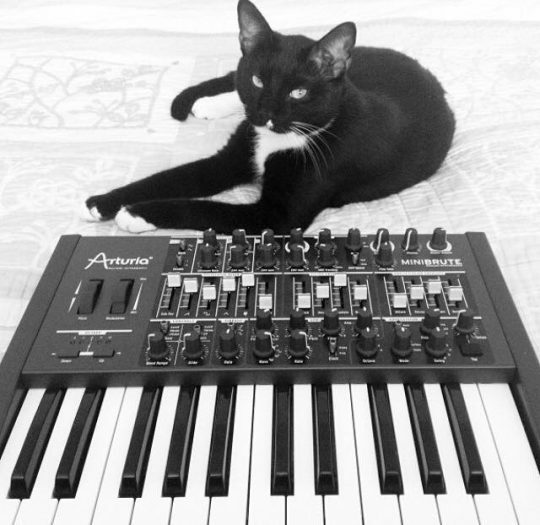 Our black-and-white feline friend returns in this black-and-white photo featuring the Arturia MiniBrute, first edition. Submitted by Steve Peglar via our Facebook page. 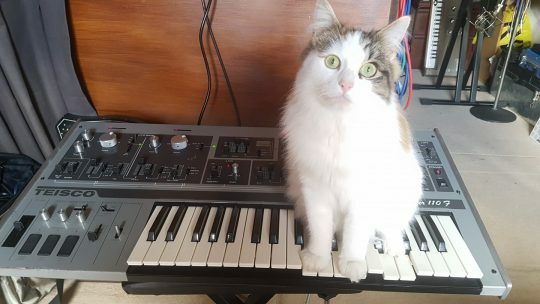 We at CatSynth have been having a lot of fun with the Arturia MiniBrute 2, which builds on the original’s unique sound (and “brute factor”). You can see our video demo here. 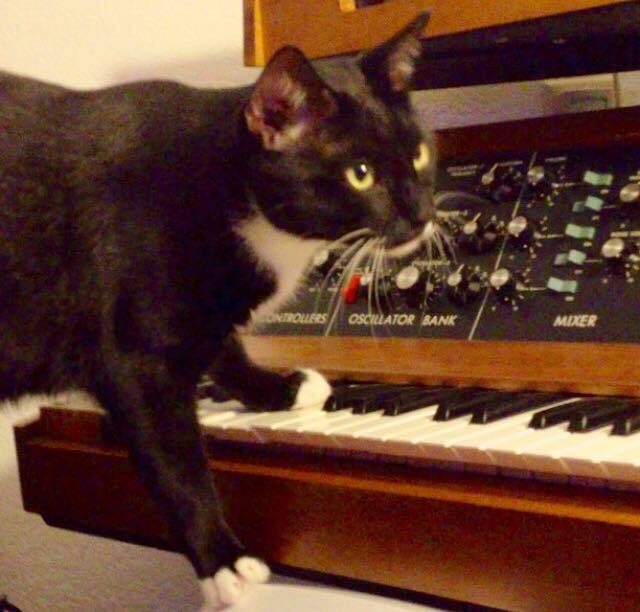 Cute cat playing a Minimoog Model D synthesizer. Submitted by Steve Peglar via our Facebook page. By Dragos Frangulea in the group Synthesizer Freaks.